Jeff and and his family were able to join us down here in Virginia for Thanksgiving again this year. Once we knew this visit was a possibility, we began planning another collaborative brews. After deciding on brewing a Wheat Wine Braggot (the details of which will be posted soon), we began sourcing the honey we would need for the brew. In addition to fitting in a brew session, we decided to try something different - making mead. The only question was if we were able to get enough honey for both the braggot and the mead. 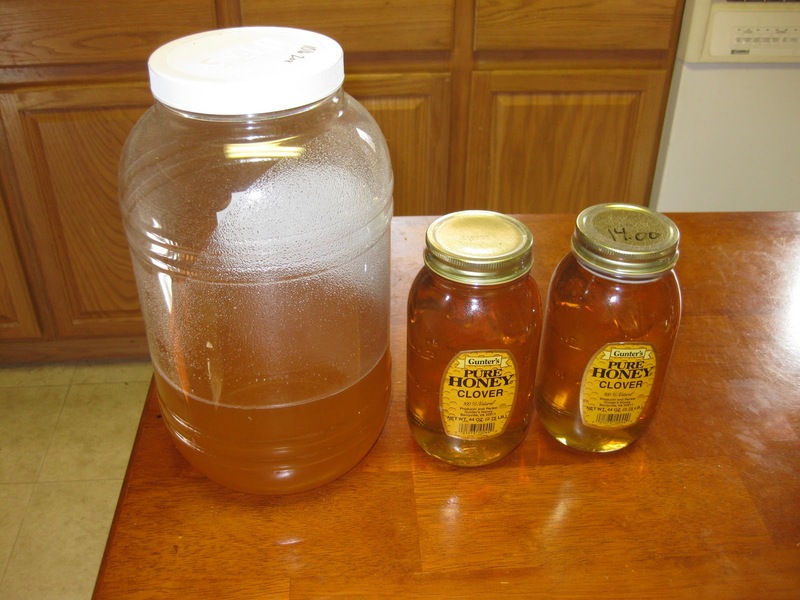 Mead is an alcoholic beverage that is produced by fermenting a solution of honey and water. Some people believe that it is the world's oldest alcoholic beverage. It is also the root of the word honeymoon, as newly married couples would drink mead for a month to bring fertility and happiness (and hang-overs). As part of the search to find the honey we needed, we decided it would be fitting (and a pretty cool backstory) if we sourced half the honey from Rhode Island and the other half from here in Virginia - a true Mason Dixon Line Mead. Seeing how honey is flavored strongly by the raw materials the bees have to work with, the idea was to make a mead from honey from Rhode Island and from Virginia. The mead could highlight some of the differences between our respective residences. For the Rhode Island contribution, Jeff talked to a homebrew buddy in RI who is also an beekeeper with one or two hives. 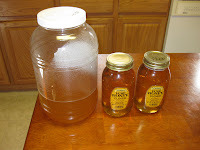 After discussing the project, Jeff's friend agreed to contribute several pounds of Rhode Island honey (thanks Bil!). The Rhode Island honey was a wild flower honey because it did not come from one particular source of flowers, but from whatever plants grew in the region near the hives. The honey was unfiltered, giving it a cloudy appearance. Its aroma was fascinating and complex with an amazing floral bouquet with hints of lavender and some herbs like mint. The Rhode Island honey's flavor was equally complex, featuring several herbal flavors, including cinnamon and mint. For the Virginia contribution, I was able to find a clover honey that is packaged nearby in Berryville, Virginia. The clover honey was a bit more of a 'commercial' product, as it was filtered and clearly labeled. It smelled and tasted much as one would expect from a store-bought honey, which is to say it was good, but uncomplex. The honey had a warming flavor, but mostly it was just sweet. I was amazed at how different the two honeys were when compared side-to-side. It will be interesting to see what flavors and aromas come through in the final mead. The mead is happily fermenting away and will probably keep doing so for the next month. I am excited to see what flavors and aromas come through in the final mead and to see if one honey dominates the overall flavor profile. If one does, I hope it is the Rhode Island wild flower honey, as it was something truly unique. Created on 11/28/10 by the Wallace Brothers. Sixth collaborative session brew. Mixed honey without heating. Added nutrients with the following schedule (25% upon mixing honey, 25% 24 hours after fermentation started, 25% 48 hours after fermentation started, and 25% 72 hours after fermentation started. Fermenting at 70 F.
12/18/10 - S.G. 1.000. Color is crystal clear straw. Nose has a bit of an herbal quality and alcohol. Flavor and nose have a lot of the RI honey character, which is herbal and a bit minty. Flavor also has some hot alcohol. 4/18/11 - S.G. 0.999. Bottled. 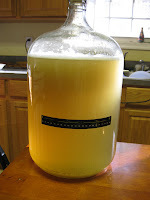 Mead is crystal clear and the same pale straw color. Aroma has a faint herbal character, which is slightly medicinal. Flavor has a honey back flavor, with a medicinal front end. 6/27/11 - Mason Dixon Line Mead featured in a homemade cheese and homemade beer/mead pairing, which is captured here. 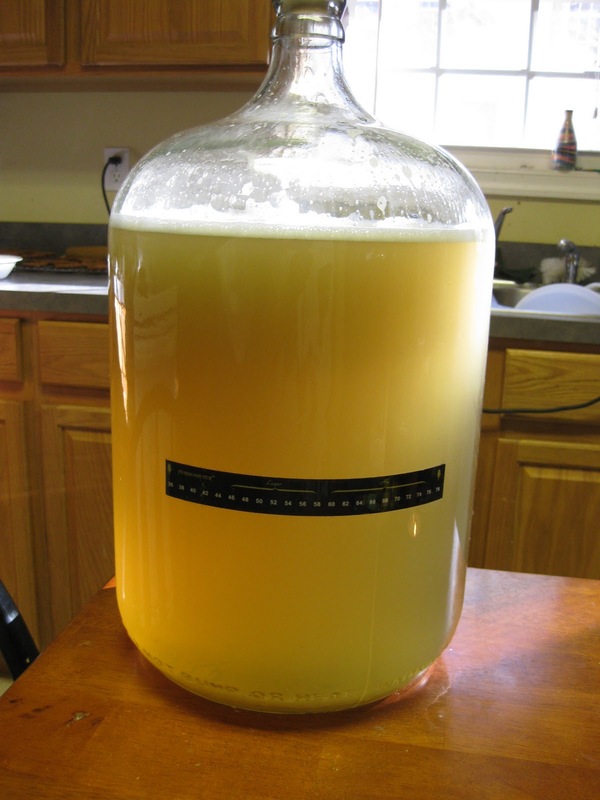 4/8/13 - Samples of the Mason Dixon Line Mead were entered into the 2013 Ocean State Homebrew Competition where the mead placed 1st in the Traditional Mead category (although there were only two entries in the category). 4/11/13 - Tasting notes collected on the blog here. Thanks for the comment, Andy. I have updated the post with our standard recipe template, which lists the OG and other information. I hope to update this information as the mead develops over time. Glad you liked the honey! I can't wait to try the results.